Born in Rome, Italy, Dominique Lacloche lives between London and Paris. Originally a fine art painter , Dominique Lacloche has exhibited in London and Paris for several years, most notably a very large multimedia installation for the Nuit Blanche 2013 in Paris at L’Eglise de St Paul St Louis, a church in the Marais renowned for its 55 metre cupola. Lacloche’s installation consisted of resin sculptures, sound, light and video mapping. It attracted 10,000 visitors during the night of the Nuit Blanche opening. In 1998 Lacloche started to work with leaves from the Gunnera Manicata plant, an extraordinary Jurassic plant which grows up to 9 feet wide. The Gunnera plants have provided subject matter, and have been used as a material substrate, for many of Lacloche’s works, exploring cycles of life and death found in nature. During her training and early years as a painter, Lacloche developed an interest in working directly with the properties of the materials she uses in her work by mixing and chemically producing her own painting pigments from rocks, stones, plants and other organic matter. 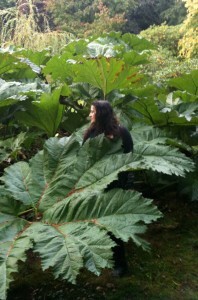 Her fascination with the Gunnera Manicata has led her to explore her relationship with organic processes, observing plant rythmes and cycles, such as metamorphosis and photosynthesis. Since 2010 Lacloche has extended her research to Multimedia tools. Her experimental work in film has allowed her to go even further in the composition of immersive enviromments. In close collaboration with Thomas Bottini a digital enginner and musician, they have not only composed several sound scores but have experimented in the elaboration of new compositional strategies by coding specific digital software and using the newest recording Binaural technology. Lacloche’s work is more an attempt at trying to understand the secret workings of nature. Of the fact that interpretation, indeed the creative act itself, must pass through abstraction to become a ‘composition’ rather than an imposition of any singular vision of the organic.